No doubt, Twitter is a tough competitor for Facebook. In this year ( 2015 ), there is a huge increase in twitter traffic. Many people including celebrities, politicians, musical bands, online marketers and bloggers are using twitter to connect with their fans. Well for online business, social media plays an important role. Not because it help us to connect with our customers, but it also give us a unique identity over internet. We can share new updates and other small information's using them which help us to be in touch with our followers. SEO stands for Search Engine Optimization. I think it wouldn't be a new word for you and not at least if you've online business website. The search visibility of twitter account is comparatively more than that of any other social media website which means that twitter account can be seen in first result page just by applying little efforts to it. So why its traffic and search visibility is rolling so fast? Is their any secret ? I think it is because of the deal between twitter and google. Did you noticed that google is now showing direct tweets in search result pages and that's the deal. Twitter will pay to google and in return, it will get a huge amount of traffic. Oh No. This deal can bring tough competition for Facebook like companies. Will discuss about this topic in upcoming posts. Fill profile bio with rich keywords that describes you in attractive way. This profile bio will appear inside description tag and thus weight for search engine optimization. Regularly tweet and use limited hashtags in it. You can re-tweet also but keep it low as much as possible. Post of your own instead of re-tweeting. Build high quality backlinks for your twitter account link and for this task you can do guest posting. 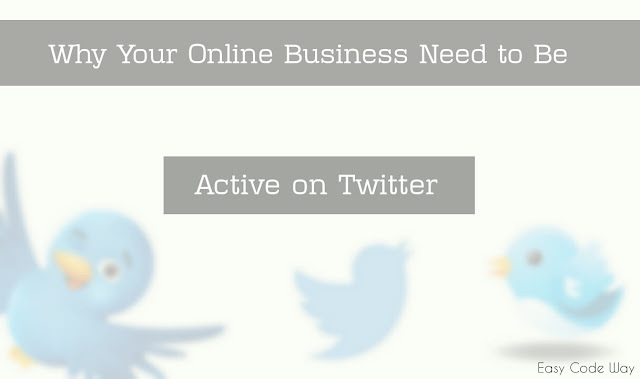 Connect your business website with twitter account using follow or tweet widgets. 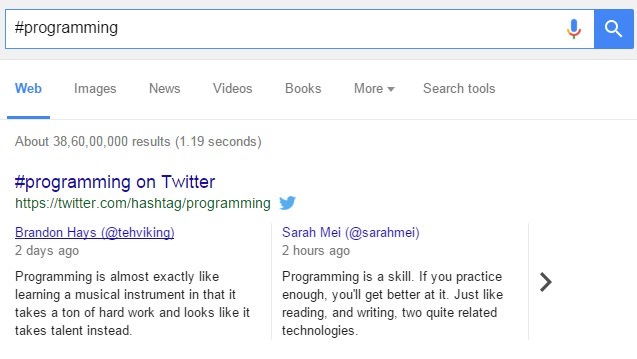 As I already mentioned, google is now showing tweets of some high profile accounts in search result pages. Apart for this, trending hashtags are also appearing same. Although it is hard for you to shown live tweets in google search result pages but it's not impossible. You just need to rise your brand awareness which may take years for you and need lots of hard work. 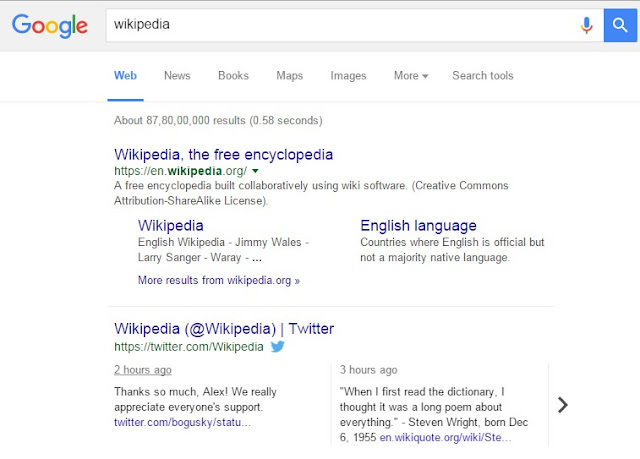 Below is how google showing live tweets for "Wikipedia" Website. Now search this term and you'll find trending tweets related to this hashtags. No doubt, twitter is the easiest way to post your latest updates. You can share everything about your work including website posts, photos, status, upcoming events etc., One thing which I hate most is the limit of characters while tweeting. You can't use more than 140 characters which is very small to share long posts. In this way you can share anything with your fan followers and this will help you build better relations with them. Twitter is best platform to find and target new customers for your business and best part is to target those people which are interested to your niche. You can also campaign on twitter with affordable advertisements to promote your account, tweets and hashtags same as in case of Facebook advertisement. Apart from this, other third-party websites are also available which can help you to promote it. So its your way and your choice. Get most out of it. As like you, there are many more newbies and professional experts in your niche interest and its for sure that they also use twitter as their primary choice. It would be better to follow those people and you'll be in direct touch with them. I personally keep learning from experts as experience is much more than hard work which can be learned from those people who had already passed their hard time in hard situations. Simply find such accounts and follow them. You can also use twitter lists to filter them. No doubt, all what I mentioned above will ultimately result into increase in your brand awareness and reputation. All you need to do is to work hard in smarter way and results will speak itself within few years.